Tries for a perfect circle, but winds up more like an oval. Full of endless circular logic and irony, director James Ponsoldt’s The Circle depicts the story of a not-so-distant future, or perhaps an alternative present, in which one company dominates digital media, data gathering, and surveillance services. Based upon the four-year-old novel by author Dave Eggers, you’ll notice some stark similarities between this motion picture narrative and the smash hit TV series Black Mirror. The biggest difference between the two is that The Circle is fast-faced and poorly written whereas Black Mirror is a slow-burning but well-written anthology series. In addition to the similarities between the aforementioned, there are certainly elements of The Truman Show in this movie as well. With a powerhouse cast, brilliant composer (Danny Elfman), and excellent editing, The Circle appears to have what a blockbuster needs; however, the hollow characters, poor character development, fractured subplots, and overall diegesis hold the film back from reaching the impact that it could have had. Having taken a digital media and privacy class in graduate school, and published a few articles, this is a film that I was looking forward to in order to analyze how the social commentary or commentary on the human condition regarding reasonable expectations of privacy and big data were integrated into the plot. Sadly, the screenplay was not strong or developed significantly enough to provide big data and privacy discussions. For all The Circle has going for it, the weak screenplay keeps it from being the blockbuster that it so desperately wants to be. A great movie typically begins with solid writing, and that is what’s missing here. After five minutes (or so it seems) of opening title logos, perhaps that is indirect evidence that there were just too many hands in the pot, each trying to take the movie’s narrative in a different direction. Much like Frozen plays off like two different movies crudely sewn together, The Circle appears to be one movie for the first two acts, but takes an unexpected and unfulfilling turn in the third. A couple of conspicuous unanswered questions come after Mae meets TrueYou designer and founder Ty (John Boyega). He designed the platform that launched The Circle. At one point he asks Mae to meet him in a secret tunnel (where all the servers are stored) and tells her that “it’s worse than I thought.” Great opportunity to introduce intrigue, suspense, and more. The problem is that the audience is never told what Ty finds or what happens with what he found. You can remove that whole subplot and the movie remains the same. There are other subplots that are nicely introduced, but never carried out as well. Any or all of them can be removed and the film proceeds the same. Not good. If you can remove several subplots or unfulfilled turning points and the film’s diegesis remain largely untouched, then you have poor writing. The third act in and of itself leaves audiences with a hurried ending that does little to provide closure to the narrative; however, it does support the film’s circular logic and irony. Hardly satisfying. In terms of the allegory here, The Circle is a Google-like company with Apple’s technology. Eamon Bailey is a Steve Jobs type innovator with characteristics of Mark Zuckerberg and Google’s Eric Schmidt. Thankfully, The Circle does not represent any one company, but rather combines all the most notable innovations and technological achievements of Google, Apple, Facebook, Instagram, and more into one globally dominating company. Antitrust issues are introduced early on, but again, that’s never fully developed. The movie highlights many issues faced by private citizens, governments, and digital data driven companies today; therefore, it sets the foundation for a movie that could have been thought-provoking, but the writing hinders that ability. The irony in the movie is for every digital answer to streamlining services or bolstering conveniences, a little privacy is eroded each time. Pretty soon, if one shares enough information, the idea of privacy is extinct. Privacy was central to the plot, but it just wasn’t handled in the most effective way. Concepts such as “off the grid,” self-proclaimed “celebrity,” and “calls to action” are displayed and discussed in the film, connecting this augmented reality to real-world issues each of us encounter or think about. One particularly interesting theme in the movie is deep friendship. Unfortunately, this was not fully fleshed as is the case with most of the movie; but still, it does get touched upon. Exploring digital media and privacy is something I have written on within the last couple years. More specifically, I explore how entertainment media companies collect big data, and the privacy issues faced therein. In 2016, I published a short series of articles on the Walt Disney World Magic Bands entitled “Magical Data Collection.” You can read those articles by clicking HERE. If you were hoping for another film like the brilliant Social Network, then you will undoubtedly be disappointed. 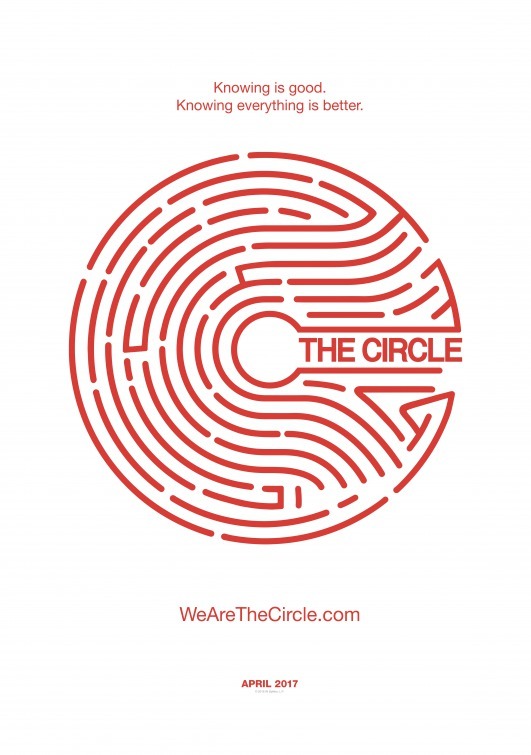 Films such as The Circle should be memorable, but unfortunately this one is very much forgettable. Coincidentally, the movie itself is as hollow as the plot and characters.